This decisive guide to day hikes in the Twin Cities' area just got better.Within the seven county "e;metro"e; area that encompasses the Twin Cities of Minneapolis and St. Paul lies a network of hundreds of miles of trails. 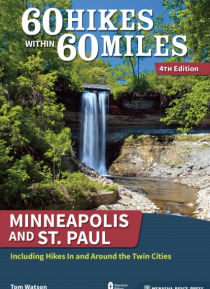 60 Hikes Within 60 Miles: Minneapolis and St. Paul by Tom Watson showcases the region's main attractions and personality. Some of these trails are broad, paved corridors… through multi-use parks generously developed to provide a myriad of recreational opportunities for the young and old, the robust trekker, and the casual stroller. Trails are based in a wide range of areas such as walkways of grass winding through majestic stands of Minnesota hardwoods. Other hikes are spider-web networks that remind one of well-used deer trails. Some are isolated within a pocket of greenery surrounded by vast ribbons of freeway concrete and broad subdivisions. Others are woven within the fabric of parklands so expansive that you could literally spend weeks hiking all the networks lying within their folds. Twin Cities' hiking is huge so get the guide that gets you there and back. Updated maps, new hikes, new photos, and brand-new trailhead coordinates make this authoritative guide even more useful than before.